Students who have purchased books from the Columbia Gorge Community College (CGCC) Bookstore can sell them back during finals week. 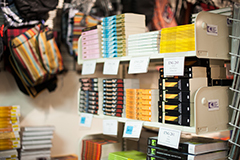 Depending on the condition, the bookstore pays roughly half of the purchase price. Not all textbooks are bought back, only books that instructors have confirmed they are requiring for future classes will be accepted back. Books from any term can be brought to sell at the book buyback. If the buyback hours conflict with your schedule, call the bookstore at (541) 506-6061 before the buyback and we will make every effort to accommodate you. There is no cash refund for books bought back. Student accounts are credited for books sold back. This credit will go towards reducing any amount owed the college or toward the next terms charges. If students are not attending the next term and do not owe anything on their account a check will be issued from the Business Office. Hours and dates are posted below and on the CGCC Bookstore Facebook page.